As host to the UN Climate Conference, Africa has recently attracted the attention of political commentators with a number of highly acclaimed, ecological beacon projects. Economic editors are much exercised by the toll-free access to the US market which is guaranteed by the AGOA agreement (African Growth and Opportunity Act) . Demographic problems are unknown, the population is growing and, with it, the national economy and the labour markets. In defiance of all the smouldering crises that continue to persist, the African continent is building a new vision of its future. Alex Vogt asks what this development means for the textile sector and, in particular, for sustainable fashion. Contemporary zeitgeist meets timeless classic: the Hamburg ALINASCHUERFELD label has its own reinterpretation of the classics: a skilful mix of materials and the interplay of colour and detail all contribute to the emergence of a new style, for which, amongst other things, the designer was awarded the BUNTE 'New Faces Award – Fashion' as the best accessories label. A major plus point was that the leather goods appeal to us not only through the elegance of their design, but through their quality and the sense of responsibility that goes into their manufacture – high-quality materials, traditional craftsmanship and environmentally friendly processing are well-established features of the company's policy. Establishing sustainability in the mainstream – that is precisely the goal that the sales and informational platform, Green Window, which was launched in September, has set itself. The idea behind it is creating easy and attractive access to green products and information – for all areas of life and for all target groups. That was exactly what appealed to the singers Nena and Rea Garvey, too, both shareholders in the Berlin start-up. Lenzing have developed a new Tencel fibre, which contains a proportion of recycled organic cotton. It will be launched on the market in 2017 – and will be offered exclusively to wholesalers and brands. The Austrian fibre producers have already found their first partners. Texpertise tip: Future. Fashion. Economics. What does the future look like for the fashion industry? What are the provisos, the trends and the catalysts for the future of the fashion industry? In Future. Fashion. Economics. Jana Kern and Alex Vogt have provided a guide to what the development of an entire sector might look like. The global non-profit organisation, Textile Exchange has just published its annual report for 2016. In this report, eagerly anticipated each year, Textile Exchange does not just report on its own activities, but also presents facts and figures, invariably across a wide-range of issues, that provide an overview of the whole organic cotton segment. It is at this point that we present people who through their work have made their mark on the eco-fashion segment. LaRhea Pepper is organic farmer from Texas and managing director at Textile Exchange, a non-profit organisation that since 2002 has fulfilled a role as intermediary between farmers, producers and retailers in the sector of organic cotton farming. We have three questions to ask her. Why did a loom form the basis for the first computer? Why in Peru do so many maths teachers come from families of weavers? And why on the island of Sumba do you say that children are ‘spun’ in the mother’s body? 600 billion. This is the number of plastic bottles that are thrown away in one year. Whilst this ‘rubbish’ raises ecological concerns, it does, nevertheless, also represent an enormous potential, demonstrated by the possibilities of PET recycling and perPETual Global, a company based in Mumbai, Singapore and London, has a chemical recycling process which is innovative. Their patented ReNEW Technology enables them to convert PET bottles back into high grade esters – the raw material from which PET is made. The result: polyester yarns, for example, which are low cost and high quality, whilst quite incidentally also offering impressive sustainability performance. From Frankfurt to Berlin. 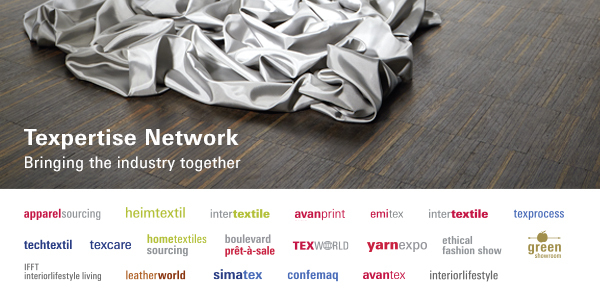 The forthcoming events of Heimtextil in Frankfurt from 10 to 13 January 2017 and the Berlin trade fair duo of Greenshowroom and Ethical Fashion Show Berlin from 17 to 19 January 2017 prove the point, if proof were needed, that sustainability is a winner. Whilst Heimtextil proposes its most wide-ranging directory of sustainable textiles ever, its ‘Green Directory’, and green topics are centre stage, the Berlin platform for eco-fashion is increasing its floor space, following on from the summer show which was practically sold out.